In A Vase On Monday ~ "Where My Rosemary Goes"
After this morning's somewhat disconcerting shock of discovering daffodils in flower on the other side of the stream bordering the garden, thoughts turned to this week's 'In A Vase On Monday'. Several hellebores are now in flower including helleborus 'Walberton's Rosemary', the large flowers of which turn a deeper pink with age. The flowers were specifically bred to look upwards and do to some extent. The flower that I had to brace myself to cut is now floating in the base of a ceramic candle container. I bought this at a local craft fair many years ago. The whole caboodle usually comes out at this time of year, when it sits on the hearth from where it sends out a warm glow in the evenings. A few left over cranberries provided a splash of colour underneath the flower. With a special thanks to Cathy over at 'Rambling In The Garden' for hosting. Now to find out what everyone else is including in this the last vase of the year. Some welcome bright sunny weather kick-started the day, so we took a stroll along the canal towpath in the direction of town to pick up last minutes essentials. 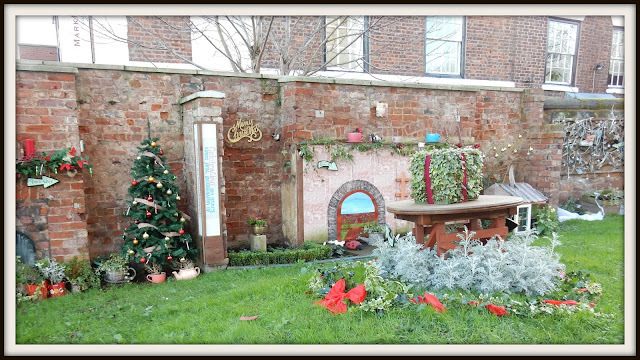 Just off the busy high street and in the shelter of an old brick wall is a small grassy area of land, which is maintained by a community arts project. Recently a seasonal makeover has taken place, which provides a most welcome splash of colour and a bit of Christmas magic to please all generations. Here's wishing all my lovely blogging friends a most Merry Christmas! This week's vase for 'A Vase On Monday' is a small posy of chrysanthemum 'Anastasia Green', which has finally flowered after much, much waiting or so it seems. It is one of a collection of five varieties of rooted chrysanthemum cuttings which I bought earlier this year from 'Sarah Raven'. 'Anastasia Green' is a half hardy perennial which is recommended as being a good chrysanthemum to grow in a sunny porch, conservatory or in a greenhouse. I wish I had access to the first two but don't, so my plants have been lurking in the greenhouse for some time in anticipation of the frosts that we've not had as yet. They are straggly and gangly creatures which are getting in the way. I could forgive them if they were more floriferous but they have not produced much in the way of flower. Growing chrysanthemums is a first for me and I think that I need to do more research into both varieties and cultivation. Just round the corner from here is a garden which has a fabulous pink variety in numbers in the borders growing at the base of a short wall. They flower their socks off each autumn and are obviously happy and hardy. Maybe one day I might come across the gardener of the household to ask its name. I also think that I didn't perhaps give my plants enough tlc or sunshine. The allotment would probably be a more suitable home. I would like to try again as their late autumn flowering is a huge plus, so it's back to the drawing board over the winter. Any recommendations would be most welcome especially hardy varieties. In case you are wondering the garlic jar has absolutely no relevance - it just happened to be there. The little vase is one of a cheap collection of four decorated differently coloured vases that came from Lidl. It's ideal for just holding a few flowers. Thanks as always to the lovely Cathy over at 'Rambling In The Garden' for hosting a weekly get together of vases from all over. I'm looking forward to seeing what other flowers are playing starring roles today on this last day of autumn (in the northern hemisphere). Wordless Wednesday ~ 700,000 Lego Bricks & Counting! "We are into December, Mid -winter-monath in old Saxon, and what a difficult time it is to fill even a few vases in the garden" ~ from "The Illustrated Garden Book' by Vita Sackville-West. This is a most generous tree as it produces a second flush of flowers in the spring. It's the autumn blooms that are most precious and the show this year seems particularly floriferous probably because of the mild autumn we've experienced. This afternoon I've got to concentrate on wrapping up and prettifying the seasonal pot pourri I mentioned in my last post, as I'm meeting with the recipients tomorrow. However I'm looking forward to sitting down this evening to do some virtual vase visiting. Thanks to Cathy over at 'Rambling In The Garden' as always for being such a brilliant hostess. 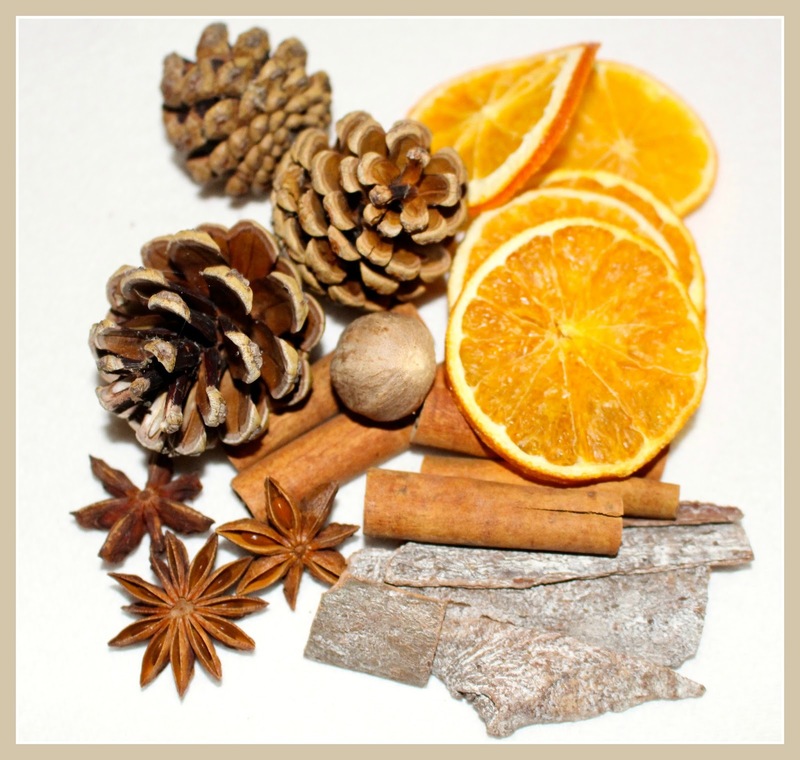 A production line has been in operation in the kitchen this week putting together some gifts of Christmas potpourri. It was quite relaxing sitting there making this concoction - all that was missing was some suitable music and a glass of sherry. My potpourri mix started with the pine cones, which were picked from the campsite in Normandy where we stayed this summer. To them I've added dried orange slices, some star anise, cinnamon sticks, cinnamon rough sticks and nutmeg. The resulting scent is most subtle and soothing. Other ingredients can be added as you go along e.g. dried cranberries or rose hips for a dash of red, bay leaves for a hint of green, dried flowers etc. It's possible to dry the oranges yourself which is what I originally intended to do, but I conveniently came across a boxed set of them in a well known German supermarket, along with boxed sets of the cinnamon products. 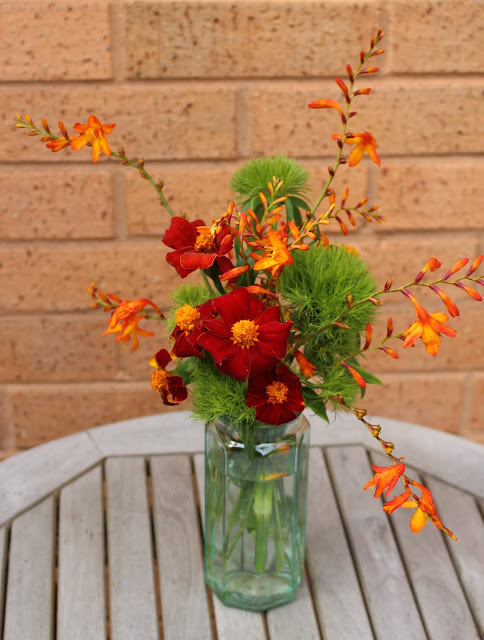 If this stroke of serendipity had not transpired, I would have purchased most of the ingredients online from a company specialising in florist supplies. This is much cheaper than buying the small jars of spices that you come across in supermarkets. The star anise however was purchased as a small jar, simply because I wanted to see that it had not been broken in transit which is what sometimes happens. The next step will be to bag the ingredients in some snowflake adorned cellophane bags and tie them up with some pretty string or ribbon. I will also be dotting one or two bowls of this mix about the house. As I suffer from asthma I have to be careful when it comes to introducing any scented product in the house. I'm sure that there is nothing in this concoction that will bring about the dreaded wheezing. Should the potpourri become jaded as we all do at some point over the festive season it can be revived with a drop or two of essential oil e.g. orange, cinnamon etc. Are you still busy making any festive gifts or is all the present preparation already done and dusted? 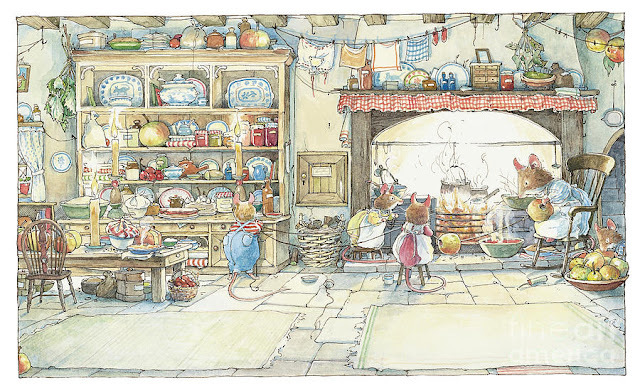 "All the kitchens along Brambly Hedge were warm and busy. Hot soups, punches and puddings bubbled and in the ovens pies brown and sizzled. Clover and Catkin helped Mrs Apple string crabapples to roast over the fire. The boys had to sit and watch because they ate too many. "It's not that I mind, dears, but we must have SOME left for the punch!" "
Does anybody else grow 'Red Sentinel' and if so what is your experience? I'm not sure whether the berries have been purloined by creatures or whether the ferocious gales we've had of late have stripped them off the branches. Another of those garden related mysteries which I will no doubt ponder over for some time to come probably never to reach a clearcut conclusion. It seemed as if the frost would never come. Late November, and there are still lush mounds of bright green nasturtium leaves, around the feet of the yew cones in the plates-bandes - the trailing sorts, spilling out in their exuberance over the little box hedges, which are themselves sprouting soft new growth after the August clip which should have seen them safely into winter. Pots of violet-blue streptocarpus which should by now be over-wintering on the bathroom window-sill are still lining the steps up to the back door. There are white geraniums and raspberries still. Roses too of course - Portlands and Chinas, moschatas and noisettes - even a solitary pink bloom on the blue steel foliage of 'Queen Of Denmark'. And all the tender evergreens are still outside : a single precious ball of phillyrea, three pyramids of myrtle, and fifteen big standards of Seville oranges which will take two of us to shift when the time comes. In a normal year they would already be tucked in the house. And tonight there's a cold rising wind from the north. As darkness falls I can smell the cold. On the six o'clock news there are pictures of snow in Scotland and on the east coast. It's too late to move things now. 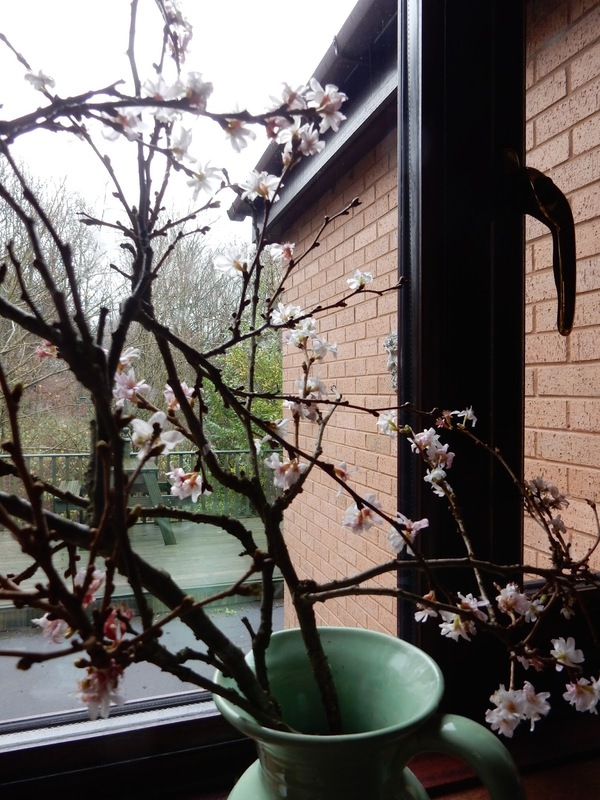 I go back out again to swathe the orange trees in fleece, drag the myrtles and phillyrea into shelter, move the geraniums and streptocarpus closer to the walls of the house. The wind whips the fleece out of my hands, unravelling. I go back in to fetch string and scissors and a flashlight. By the time I finish, the cold is pinching my nostrils and striking up through the soles of my canvas shoes. In our house we call the 'homework on the bus' syndrome. It's always the same : however much time I have, I always seem to be behind it". ~ extract from 'The Morville Year' by Katherine Swift. Illustration of 'Blowing Leaves' by Arthur Rackham. 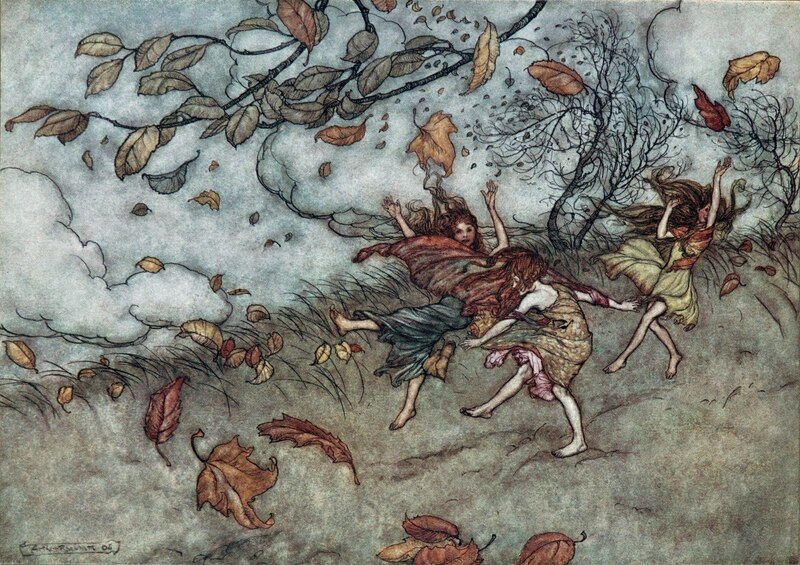 Was it just me or was anyone else dashing around yesterday to get all those sensitive plants under cover before that first frost descended? Coming out of my cold frame for some exercise especially for GBBD is saxifraga cortusifolia 'Silver Velvet'. This was a purchase from a plant fair held at Abbeywood Gardens in Cheshire this August. It should have course been planted by now but I think that it may well now reside in the cold frame overwinter. Although the dark foliage is what initially caught my attention its delicate starry late autumn flowers have been its selling point over the last couple of months. It is admittedly going over now but I was not around in October much to take photos. There was little information on the plant label when I bought it so a delve into Google pointed me in the direction of a post on the very same plant from Helen over at 'The Patient Gardener'. Here you can see the plant in more close up detail. Getting a decent photograph has been a struggle with the poor light and blustery wind that have been assailing this neck of the woods. Helen kindly provided me with some more information about 'Silver Velvet' reassuring me about its hardiness. Like Helen I'm debating about where and what to plant it with but am presently leaning towards planting it in the company of some ferny goodness. Being a woodland plant it prefers some shade but not dry shade. A special thanks to Carol over May Dreams Gardens, who so generously provides us with a monthly platform to share the flowers and foliage that are giving us pleasure, as well as a brilliant opportunity to add to our wish lists! Now where's my notebook and pen? In A Vase On Monday ~ Gourdness Gracious Me! Can it really be two years since Cathy over at 'Rambling In The Garden' made her first 'In A Vase on Monday' post? Well it well and truly is so time to join in the celebrations today! I must admit that I was slow to get off the ground with participating in this meme. My first vase did not materialise until April 2014 - during that year my sum total of vases was a miserly eight. However this post will be number nineteen to date this year so I'm obviously getting the bug along with many other bloggers. 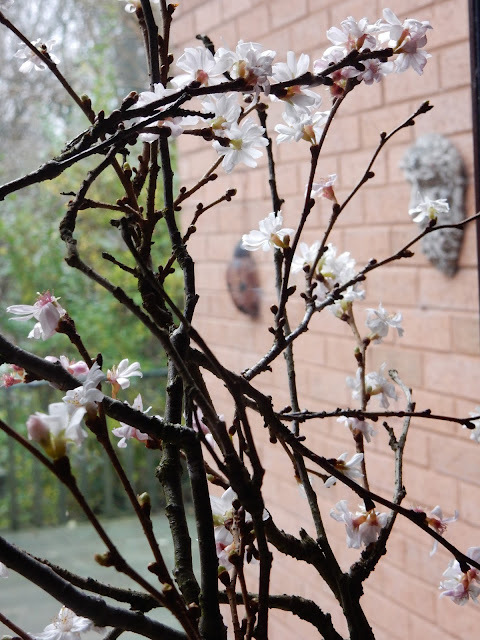 I had never really been in the habit of picking flowers to bring into the house to enjoy at close quarters. I may have bought in the odd small posy of snowdrops in the depths of winter and have regularly picked bunches of sweet peas from the allotment, but that was the extent of my vases, unless I treated myself to a shop bought bouquet or was treated to one. Now I'm really beginning to anticipate what I might be able to pick for a vase and to enjoy putting them together. I've also recently realised that I do have a cutting garden although the penny has been very slow to drop. I've always had a couple of beds at the allotment which I use for growing flowers and herbs but have never thought of them as a cutting garden as such. I'm considering expanding these beds next year. Not only will it give me the chance to grow some old favourites but also plants that I've not grown before. I already have a long list of flowers/foliage that have caught my eye as I've admired other vases. Most of these will be annuals. Considering that it's a party today the weather gods are not behaving today chucking down rain and blowing wind which is most inconsiderate of them. So my vase plans have had to change accordingly. I've gathered together a number of gourds which came back with us from our recent holiday. Yes we tend to bring odd souvenirs back with us from our travels. I used to be able to buy gourds to ring in the seasonal changes from our local Country Market but sadly this closed during the summer. I shall definitely be buying gourd seeds to sow next spring. The pumpkins are 'Wee Be Little' which I grew at the allotment this year and which will be eaten in due course. Although on the small side they are most tasty and keep well. The gourds are sitting on a special plate made and given to us as a wedding gift by one of my aunts. The candle needs no explanation. It's contained in a glass jar hand decorated by either my mother or sister. I can't remember which so further investigations are called for. There is a dragonfly on the other side. I shall be removing this arrangement to the living room later, where I will be lighting the candle for a warming glow in the long November evenings to come. 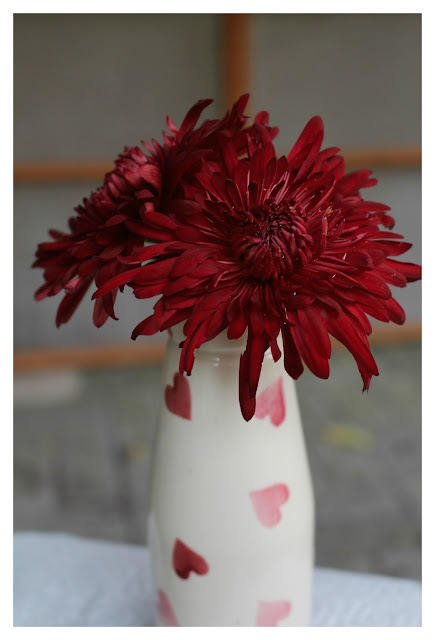 Leaping into this week's 'In A Vase On Monday' and supplying the post title are the the three 'John Riley' chrysanthemums from last week's vase. Will they still be going strong next Monday? They have been joined by a couple of stalwarts which have featured in previous vases, namely mathiasella bupleuroides 'Green Dream' and dianthus barbatus 'Green Trick'. Both of these plants are now at the tail end of flower production days for this year and the flowers that I picked are perhaps a little past their sell buy date. I was reluctant to pick the mathiasella until I saw signs of new emerging flowers on the plant. I have just checked and it featured in a vase on 8th June this year. This plant has been in flower on and off since May so certainly works hard for a living. It took a good two or three years to establish but has flourished since. Moreover it seems untroubled by pests/disease - sssshhhhhh - dare I say that out aloud? My only complaint is that I always have to check its spelling and the fact that it's a mouthful to get my tongue round. The dianthus occupies space at the allotment and featured in vases in July and August. Although this week's vase is perhaps my favourite of the three, looking at and comparing the respective vases has made me realise what a versatile character 'Green Trick' is. I intended to take cuttings but smack wrists haven't done so. They are described as short lived perennials so I really hope that the plants come through the winter. The red twiggy bits are from an overgrown cornus (variety unknown) which is in need of a good prune. The foliage is from one of my favourite plants - brunnera macrophylla 'Jack Frost'. I'm not sure how long the leaves will last in water so will be observing closely. I've no idea where the vase came from or how long I've had it. There's not even a single clue on its base to suggest its origins. It's a most useful vessel though. Thanks as always to Cathy over at 'Rambling In The Garden' for being such a gracious hostess every Monday. October is coming to an end with snowdrops and sweet peas. The snowdrop in question is one of my specials 'Galanthus plicatus 'Three Ships' - well I that's what the label purports. If the identity is correct it's certainly sailing in well ahead of time. From what I've read about it although an autumn flowering snowdrop, it's more of a late November/ December bloomer than a late October star. I will have to get out my snowdrop tomes and do some serious research. This week on the sweet pea front I've picked what will probably be the last vase worth of the year from the allotment. I thought that I might have picked the last bunch just before we went off on holiday in the last week of September but returned to find that the plants have got a second wind. 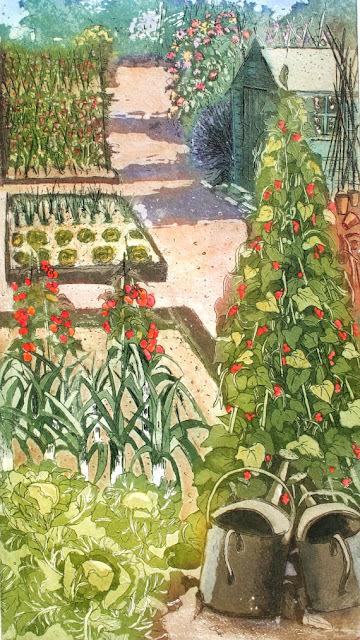 I will do a separate post on this year's sweet peas soon. I was thinking of missing out on autumn sowing again this year but had a change of heart so a batch of 'Cupani' have just gone in. I'm trying a late October sowing rather than an early one to see if this will produce less leggy plants by the time they are ready for planting out. I must admit that I have been very much in the doldrums recently when it comes to both garden and allotment which I think explains why I've not participated in the EOMV for some time. In fact I've just checked and June was my last contribution! Lack of time has been a real issue this year which may be hard to understand as I'm no longer working. In theory I should have all the time in the world but in practise it's not working out like that at the moment. I was hoping for a bit of catch up and to do some planting when we returned from holiday earlier this month. However I had more or less no sooner unpacked when I had to unexpectedly down tools to go and care for a poorly mother. So October has gone by in a blink. It doesn't help that October has been a most benign and gardener friendly month. I had been feeling decidedly peeved at missed gardening opportunities but I'm trying to be positive and think ahead to next year now! I have bulbs to plant (too many as usual), have just ordered a new shrub promising dazzling autumnal colour and am considering one or two perennial purchases for spring delivery. I've also cheered up every time I go out in the garden at the moment by the new crab apple that we planted back in February 2014. Malus x robusta 'Red Sentinel' has produced its first ever fruits which are an absolute delight. The books say they quite often last until the new year and so far there seems to be little in the way of damage from the elements or theft from the feathered population. Thanks as always to the lovely Helen over at 'The Patient Gardener's Weblog' for hosting this most useful and informative monthly meme. Taking centre stage this week is the second of my chrysanthemum collection to flower. I know that Cathy, our intrepid 'In A Vase on Monday' hostess also bought the same collection of rooted chrysanthemum cuttings from Sarah Raven as I did earlier in the year. So I've been wondering how her plants are faring of late. Any blooms yet Cathy? We are both keen to see the acid green 'Froggy' leap into action. This particular chrysanthemum goes by the name of 'John Riley' and it's a tender perennial. The flowers took me by complete surprise returning home on Friday after an unexpected absence of a good few days. The vase has been lurking on a hall window sill for some considerable time but has never been used for flowers before. It's an Emma Bridgewater Pink Hearts Milk Bottle Vase and was purchased a few years ago via eBay. The neck of the vase is on the small side but three flowers slipped in nicely. Now I will wait with bated breath to see if the flowers live up to the information that they will look good in a vase for up to three weeks. The rest of the collection has still to flower but there are buds and tantalising hints of colour so fingers crossed for a late autumn show. After an absence from the garden catching up with my chosen tree and its neighbour was much anticipated on my return. We arrived back home in darkness so it wasn't until the next morning that I hurtled out to see my trees with visions of finding some ripe pears dangling from the branches. I had given up any hope of eating fruit from the 'Doyenne du Comice' tree this year but was looking forward to munching pears from its neighbour a few feet away. Back in September there were nine healthy looking tantalising fruits dangling from its branches. Well what was waiting for me? Not a single solitary pear was left on the tree and no traces of cores or pips in the vicinity! Oh what disappointment and yet another year to wait before I eat one of my own pears. This waiting for my first homegrown pear is in danger of becoming a saga that may yet outlive me. I must admit that in the flurry of activity that seems accompany holiday preparations, I may have not paid close heed to them in the week or so before we left but they were definitely still on the tree when we left. I understand that the weather was mainly dry, sunny and warm whilst we were away. However there was one wet and windy day, which may explain the rather large broken tree branch I found on the ground nearby. This was from a tree growing on the boundary of the garden not so far from the pears. My theory is that the fruits had probably ripened in this golden spell of autumn weather, only to be shaken off on that one wild day and snaffled up by one of the many passing grey squirrels which haunt the garden. Oh yes I can imagine that the flavour combo with horse chestnut conkers would be quite delicious. Well the wait goes on. My chosen tree is now looking rather sorry for itself as you can see from the top photo being already almost completely undressed. I'm sure that it did not look so weary last October. In comparison its pear tree neighbour is still wearing mainly green. Back in September our hostess Lucy commented that she would like a closer peek at the rust affecting some of the leaves. In response to this I took a couple of photos. I will add these as a postscript to September's post but have also included them here. If you have a pear tree and see orange spots like this take action and remove the affected leaves. I was slightly consoled by a comment from Brian over at Our Garden@19, who said that his pear tree was affected by rust for the first time this year. Maybe it's just not been the year of the pear. Thanks as always to Lucy over 'Loose And Leafy' who hosts this meme where tree followers and their trees gather from all over the show gather every month for an update. There has been quite a major change on the home front here when himself retired at the end of May. One of his long held wishes was to go on a rail holiday in Europe to celebrate and that's what we have just done. Starting off in Amsterdam we then travelled on to Berlin, Prague, Bratislava (a last minute destination instead of Budapest), Vienna and finally Frankfurt before arriving back home on Saturday evening. We have some absolutely fabulous memories including seeing the finishing stages of the Berlin Marathon as the runners came through the Brandenburg Gate, walking around the enchanting city of Prague, and in Vienna visiting the jaw- dropping formal gardens at the Schönbrunn Palace as well as watching the Lipizzaner horses train at the Spanish School of Riding. However we've taken away some most poignant and sobering memories too of groups of refugees gathered on the concourse of the main railway station at Vienna. Their numbers included some family groups but what was particularly noticeable were the significant numbers of apparently single young men, most of whom were travelling with very little in the way of possessions. On our departure from Vienna for Frankfurt on Friday morning, several of their numbers were waiting for the same train as us and we were asked several times for confirmation of the train's destination.The journey started but for many of them ended prematurely at Passau on the German border. Here a number of police officers walked through the train to check whether they had visas to enter Germany, explaining that without these they could proceed no further. The outcome of this was that a number of refugees had to leave the train. We're sure what happened next - our last sight of our fellow passengers was as they were shepherded into an queue on the platform. The experience certainly put any small worries I have into perspective and reminded us of just how fortunate we are. On a lighter note although we only visited one garden as such during the trip, I had to make several compulsory pit stops to gaze at gawp at the displays outside florist' shops. My 'vase' this week is one that caught my eye in Bratislava. 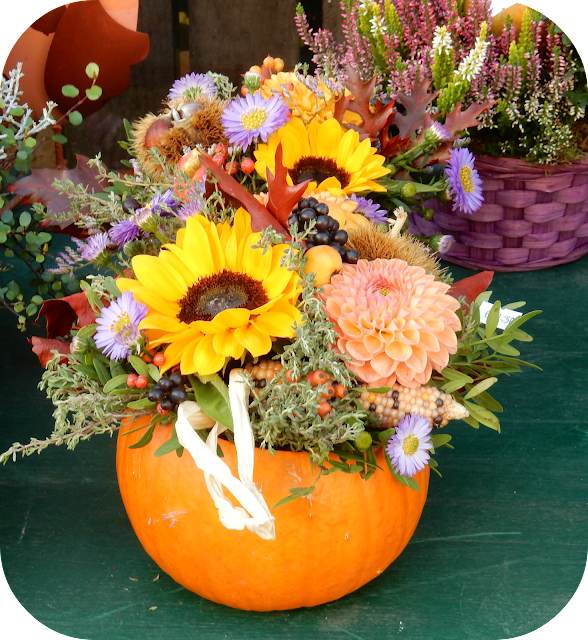 In the pumpkin were asters, a dahlia, a sunflower, various hips and berries, richly coloured leaves, a couple of ears of sweet corn, hedgehogy cases spilling out sweet chestnuts, crab apples as well as what looked liked sprigs of herby goodness. Being a rather clumsy I dare not risk getting close up to peek to see how the contents were secured in case I disturbed the rest of the display. I did not have the energy yesterday or have had time today to come up with my own vase and take photos but thought that this is one that is calling out to be shared. With thanks as always to Cathy over at 'Rambling Over The Garden' who came up with the brilliant concept of 'A Vase On Monday'. Do call in and wonder over vases from near and far.